Raised Buddhist by a lapsed Catholic and recovered Jew in her Holocaust-survivor grandmother’s home. Alice Fraser chronicles the world of her childhood through the eccentricities of the people sharing her falling-down home: the manic-depressive Chilean gardener; the Christian Hungarian who should’ve been her grandmother’s enemy but somehow wasn’t; the veiled Indian woman who lived downstairs. 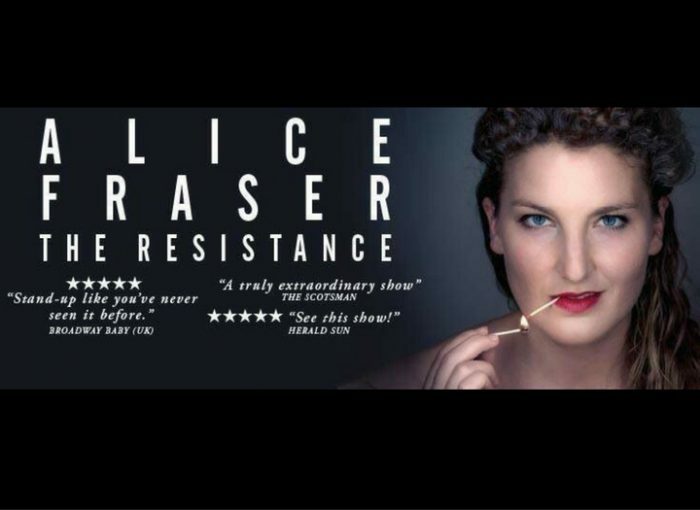 Freshly back from the Edinburgh Fringe, Alice (the person writing this blurb) is bringing her critically acclaimed show, The Resistance home to Melbourne for one week only. This is a show about the strangeness you accept as normal, and the brutal truths you can find if you look in the right places. It’s an hour full of silly fun, punchy jokes, witty songs, and just a bit of optional tragedy.